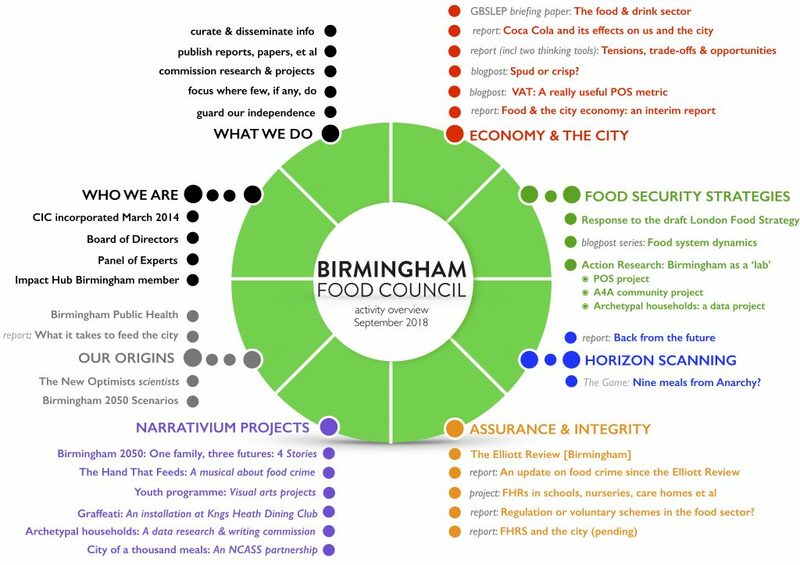 The Birmingham Food Council CIC is independent, a critical friend to the socio-political set-up. We focus our limited resources on important matters that don’t get much attention or airtime. Perhaps remarkably this currently means food and the economy, also food safety, integrity and assurance, plus the role we can play in responding to the strategic challenges of food security whether at a global, national or city level. In 2017-18, we ran an horizon scanning project, the first of what will be a regular series; see the project report Back from the Future and The Game. We also commission ‘narrativium’ projects, with particular emphasis on engaging the upcoming generation to help us communicate the important issues we raise. The info-diagram below is a summary of our focus in 2018, thus includes the significant activities and projects we’re doing, and some of our previous work that is relevant to it. An overview of our strategic plan is here. You can find our reports and papers here and blogposts here. Our Annual Reports and accounts are published here. We also collate reports and papers by other people and organisation which you can access here.